Home / alden richards / alden richards album / AlDub / Banner Stories / Eat Bulaga! / featured / maine mendoza / Did Maine Mendoza leave Twitter? Did Maine Mendoza leave Twitter? You may have to miss some of Maine Mendoza's online quips. Around 6:30 PM tonight, June 3, it looks like Maine Mendoza deactivated her Twitter account. It's no longer searchable. Bookmarked tweets tagging her Twitter handle also now bears dead links. 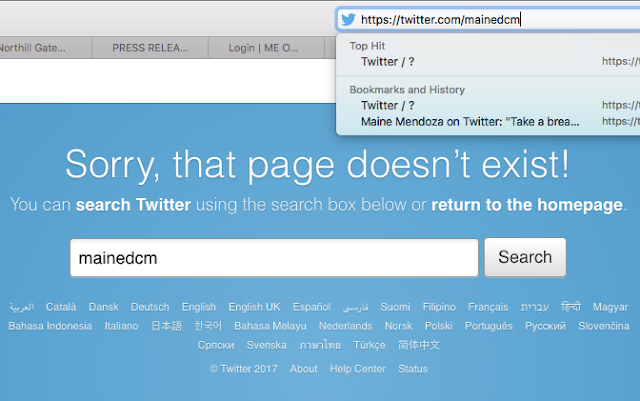 Upon searching her Twitter URL www.twitter.com/mainedcm, an error message that the page does not exist is also displayed. What happened to Maine's Twitter account? 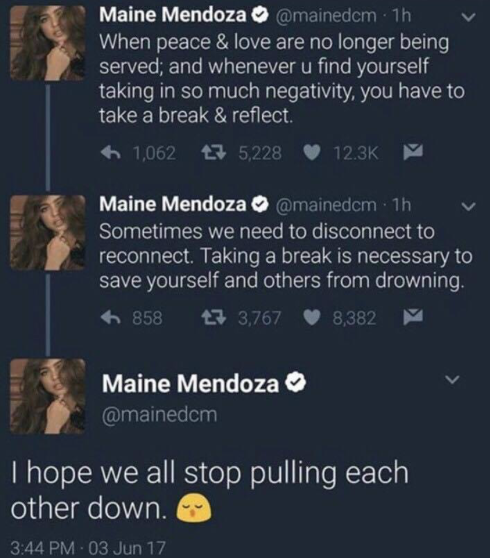 A few hours before her Twitter account was inaccessible, Maine posted cryptic tweets. One tweet reads: "Whenever you find yourself taking in so much negativity, you have to take a break and reflect." On Thursday, June 1st, Maine Mendoza reminded her fans to stop tweeting "foul words". "I know how much you love us and how hard you try to protect us but enough with the foul words, guys. Hindi na tama," one tweet went. Maine's alleged closeness with Sef Cadayona and Gabbi Garcia's guesting on Eat Bulaga last Tuesday, May 30, became a hot topic among AlDub fans in the past few days. Some of the tweets from fans accused Maine of defending Cadayona. Maine tweeted: "Dapat ba lagi may pinagtatanggol? Hindi ba puwedeng sabihin lang kung ano yung tama? Oh btw (by the way), that tweet is for you all." Cadayona has denied the rumors in a recent interview with Philippine Entertainment Portal. "Friends po talaga kami, as in. Parang sa amin, sa mga kaibigan niya, bakit parang bawal siyang makipagkaibigan," Cadayona said. Maine's second tweet on June 1st read "I do not get how people can throw so much hate on others. I mean... inano ba nila kayo?" One of Maine's final tweets on Sunday afternoon said, "Sometimes we need to disconnect to reconnect." Mendoza's Twitter already has 4.5 million followers.